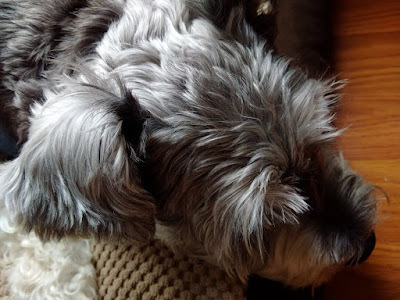 It was well after midnight last night when I managed to rustle Frasier the Wonder Schnauzer out of his big comfy dog bed and out of the house for his nightly walk. The streets were quiet, and I could feel the wind blowing through the increasingly bare trees as he bolted out the door and bounced himself across the lawn. Even at the ripe old age of 9, he goes from snoring to puppy-like in no time at all: Another reason to love him. I pulled the zipper of my jacket tight and silently thanked whoever invented the standup collar that acts like a neck warmer. Whether it's fashionable or not is irrelevant to me, especially at oh-dark-twenty. As much as I appreciate the in-between seasons where we're neither sweating ourselves into a puddle or shovelling the ourselves out of a deep snow drift, I simply hate that drafty feeling when you first step into the snap of a Canadian autumn night. So anything that keeps the miserable chill at bay is, by definition, a good thing. We walked across the fallen, mashed-up and rather stinky crabapples, the crunchy leaves, the unmowed grass still slick from the day's rains. The sky overhead was painted with low-flying, uniformly grey clouds, and a smudge of the moon made itself known just beyond the tall trees across the street. Somewhere in the distance, a freight train blew its whistle, the sound carried all this way by the unusually strong winds. I love when that happens. I followed the little guy as he followed his nose, relentlessly sniffing at whatever it is that dogs like to sniff before I finally pulled him away. Wash, rinse, repeat, as thousands of years of canine genetic massaging weren't about to be undone by my furtive yanks on his leash. Without the interruptions of ringing phones or email or instant messaging, it was just me, him and a whole lot of nothing, and I'll admit it was a pretty comfortable place to be. I watched him stagger from one side of the sidewalk to the other as he discovered new things to sniff and explore. I wondered if he was thinking about anything more involved than that next fire hydrant, tree or patch of grass. I mused about what goes through his mind on walks like these, and thanked the universe that he didn't have to worry about some of the nastier things that humans have to deal with, like drunk drivers plowing into pedestrians or racists who attack others simply because of their religion. I smiled to myself that, no, he had no clue, another blessing of being a dog. Eventually, we made our way around the block and I found myself fiddling with the key as he stood patiently on the front step, staring intently at the door knob as he always does. I leaned down and gave him an extra rub behind the ears before opening the door and following his wiggling form inside. And as he disappeared around the corner and headed for his traditional post-walk visit to his water bowl, I wondered if he knew just how much I've come to enjoy these seemingly trivial nightly walks, and how I was already counting the hours until our next tour of the neighbourhood. Your turn: Rituals that you've come to rely on. Please discuss.